In a disappointing move, the Geron Corporation announced that it is halting its stem cell programs, including the first-ever, US approved human trial using embryonic stem cells. The human trial enrolled its first patients last year and was evaluating the safety of using embryonic stem cells in patients who had recently suffered a spinal cord injury.A company announcement in October 2011 indicated that treatment was proving safe in patients treated thus far, with no significant side effects.With Geron’s halt, no new patients will be enrolled, but current participants will be followed, and the FDA will be kept informed of their status. The company cited financial decisions are leading the company to narrow its focus to cancer research, particularly on drugs that are in mid-stage human testing.The decision will also result in a 38 percent reduction in Geron staff. Given the promise that stem cell therapies hold, the loss of an FDA-approved human clinical trial (one of two currently underway in the US) certainly does not help forward progress. And, given Geron’s status as a leader in stem cell therapies, their decision also does not help the US maintain a leadership role in this innovative medical arena. 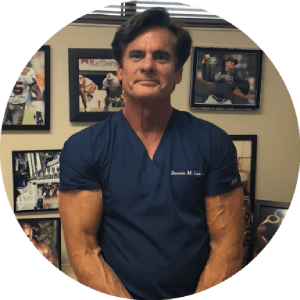 Dennis M. Lox, MD, has been preforming Stem Cell Therapy for several years. He is located in Clearwater, Florida in the Tampa Bay area.